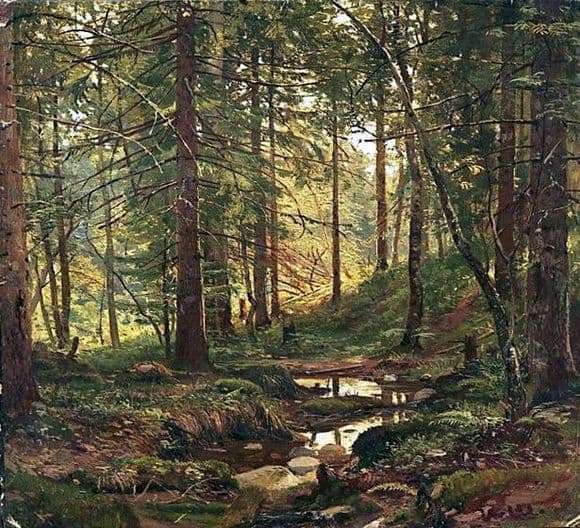 Shishkin is famous for the fact that he can very realistically depict all small and at first glance insignificant tracts of his native land. By the slightest brushstrokes of the master, it becomes immediately clear that the artist is not able to imagine himself without his native Russia. “The stream in the forest” seems to be alive on the canvas, it seems you can even hear the birds singing and the grove makes noise. Before the viewer appears beautiful pine forest, which runs the stream. Around him are pines. It is evident that some pines are already very old and look like some giants, their branches are spread out to the sides, but there is not a single needle on them. Despite this, they are still great and strong. Further, the viewer draws attention to the nearby, very young pines, which supposedly ask the formidable giants to move around and give a place closer to the living and impetuous stream. Naturally, the stream is central to this picture and occupies a central place in the exposition. Every turn of it and the play of light, drawn with maximum precision. You should also pay attention to how each blade of grass is drawn, which tends to lean towards the water and stretching upwards. But is it worth saying that the life of a stream in the forest cannot boast of its ease, because the way to this cheerful and dynamic streamlet was blocked by stones. That is why he has to find another way to get to the river or lake. Cloth surprisingly beats the game of shadow and light. Despite the fact that the stream, along with the forest are in the shadows in the foreground of the canvas. In the back, they are completely illuminated by bright sunshine. You should also pay attention to the light glade, and between the trees, you can discern a blue sky. Shishkin at this time created a truly fabulous landscape that can go to a lot of Russian fairy tales. That and look, a hut on chicken legs will appear.